Whether internet companies are now compliant with GDPR is hard to say, but they sure left updating their privacy policies to the last minute. What happened in the last days of May was the greatest corporate email tsunami since Y2K. I hardly read the updated policies, or remember what the old ones looked like. Wouldn’t it be great if we could model where GDPR inspired policies are different from the old ones instead of reading them? Looking for data, I came upon the Usable Privacy Project, that has a few datasets available consisting of privacy policies. I downloaded the ACL/COLING 2014 Dataset 1, which contains roughly 1000 documents in .xml files. Collected pre GDPR, this is a great starting point. But I still need a respectable amount of policies inspired by recent European regulation. The researchers behind the Usable Privacy Project paid mechanical turks to collect policies; I opted for the second best thing: asynchronous web scraping. There is a very promising package on GitHub called async for asynchronous HTTP requests in R. The advantage of asynchronous over synchronous code for network operations is that in case of a response delay, an asynchronous client will issue another request instead of staying idle. Because time is not being wasted on waiting for responses, asynchronous HTTP requests are orders of magnitude faster than their sequential cousins. We are essentially creating a deferred value def which is only operated on - what follows after then(function(response) - when this value becomes known. … creates an event loop, which manages the computation of the deferred values in this particular async phase. On about 4.500 url’s this completes in less than 10 minutes. I wanted to benchmark the performance on the same data with lapply() and regular GET requests, but I ran out of patience after running it overnight to no end. After all the scraping, cleaning and parsing, I ended up with a final dataset containing 1196 policies and an indicator whether it mentions “GDPR” or not. I took the conservative approach of classifying the scraped policies as GDPR compliant only if the document contains the term, giving me 188 policies. It’s not a whole lot - because most url’s were either invalid or guarded against scraping; but hopefully just enough to get us going. I am going to skip exploratory data analysis altogether and jump straight into modeling the difference between policies. If you want to see an example of the former, I encourage you to check out my previous post on Rick and Morty. this is going to be an interesting task. First we have to convert policy texts to numbers. A common approach is constructing a document-term matrix where each row is a document and each word is a column. The cells in the matrix contain a statistic about each word in their respective document, such as tf-idf score. It is a simple and powerful way to identify important words in each document. We simply count the number of words per policy and use the number of times it appears in other policies as a weighing factor. The dimensions of the resulting document-term matrix depend on how many words we include in our vocabulary. Either way, the number of variables will quickly run up to thousands and because most words only appear in a subset of documents, the result will be a sparse matrix. Before anything, let’s split the dataset for modeling. To tokenize our text and apply the tf-idf transformations I’ll use the text2vec package. We calculate the tf-idf scores based on the train set, and only map the same values onto the validation set to prevent leakage. dtm_train_tfidf = fit_transform(train_dtm, tfidf) # tfidf modified in place! Now I’ll train three different models: Regularized logistic regression (glm), support vector machines (svm) and a gradient boosted machines (gbm). The first two are simple linear models remarkably apt at dealing with wide data - remember we have a 1,000 variables; while gbm is a tree-based method considered to be the top of the hill for classifiers. I won’t discuss the internals of these algorithms, and I will only explicitly tune the L1 regularization parameter for the glm (it performs both variable selection as well as coefficient shrinkage, thereby reducing model variance). Hopefully we get respectable performance at first attempt and can jump straight into some explainable machine learning stuffs. Gbm has the highest accuracy by a inch with around 96%, while svm slightly outperforms the rest with 82% for sensitivity, meaning that 82% of GDPR policies are classified correctly. We are of course most interested what words are differentiating the two classes of policies. We can retrieve measures for variable importance for both the glm as well the gbm models out of the box. 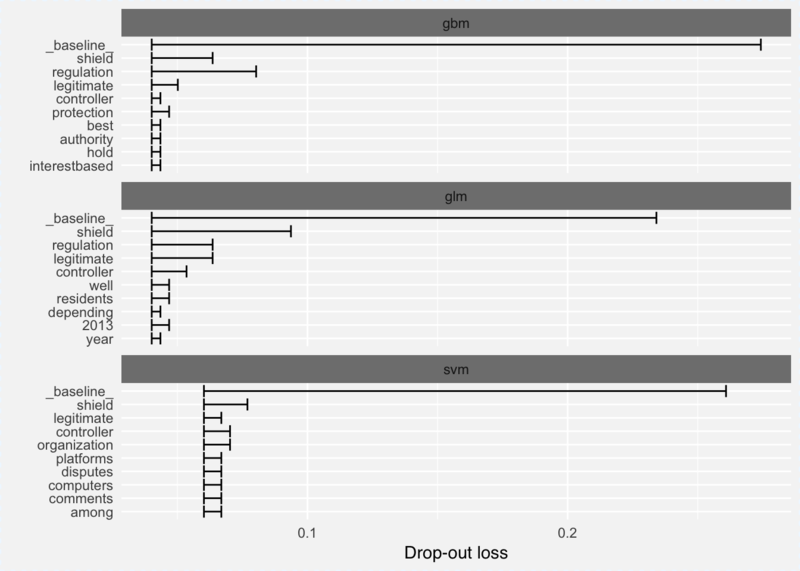 For glm we can use varImp(glm_fit) that returns an importance percentage for each variable that’s based on the size of the models coefficients. For gbm we can access the relative influence of each variable using summary(gbm_fit). Relative influence depicts the average empirical improvement of splitting by a variable across all trees generated. In both cases the word regulation comes out as most important word (I wonder if it has anything to do with GDPRegulation). 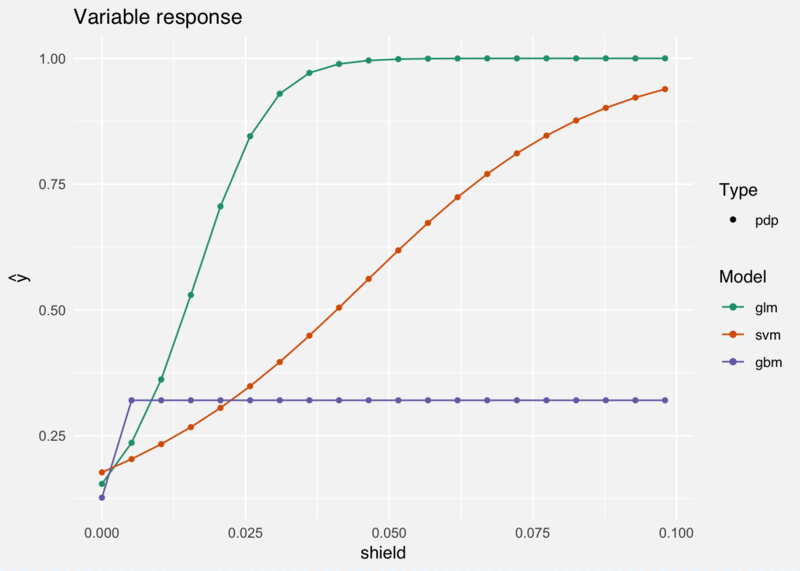 Other than that, the words data, shield and legitimate appear in both plots for the two models. The problem is of course that we are looking at two different measures for two different models. It would be better to compare the models using the same tools on the same scale using the same metrics. Article 22 of GDPR states user’s rights to receive information why automated decisions were made and the underlying data processing. Thanks to GDPR, there is a growing interest in developing methods and tools to investigate how predictions are generated by black box models. 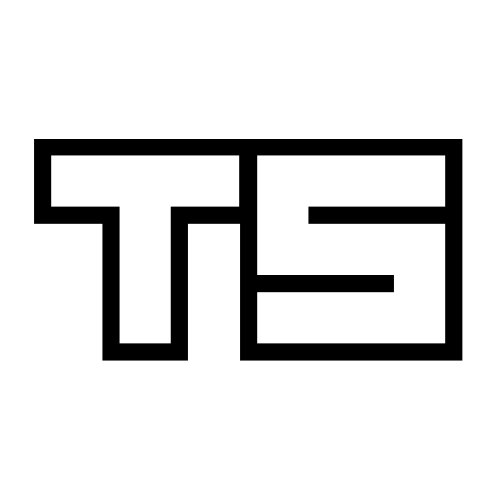 Enter the world of explainable machine learning frameworks. Basically we look at how our loss function changes with the permutation of the values in each column. For this we define a prediction and loss function, create an explainer object using explain(), plug into variable_importance() and plot the results. The left edges on the plot represent the error rate of the full model. Length of the interval means larger loss -> more important variable. 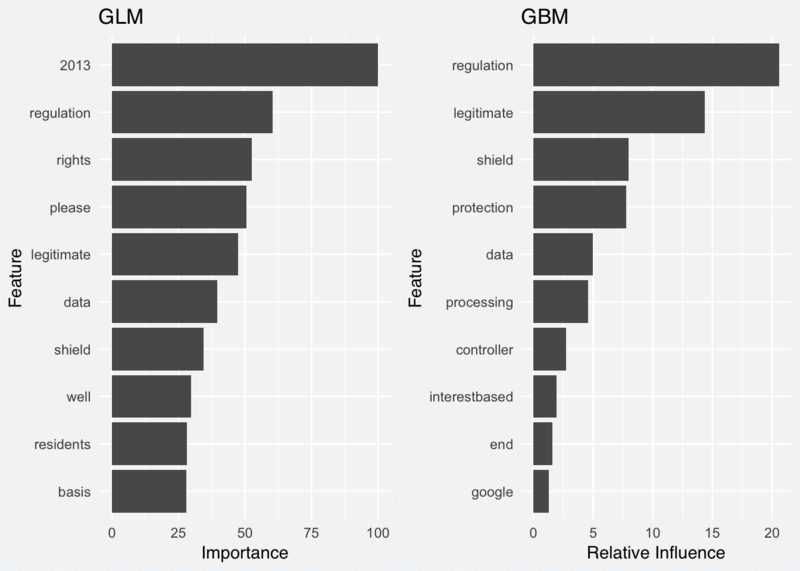 Looking at the above plot, it confirms that gbm has the lowest overall error rate and there are words shared among the three plots such as shield, controller or regulation that appear in all three plots. Note that for the words regulation and legitimate, lower tf-idf scores are sufficient for higher probability of being classified as a GDPR policy. 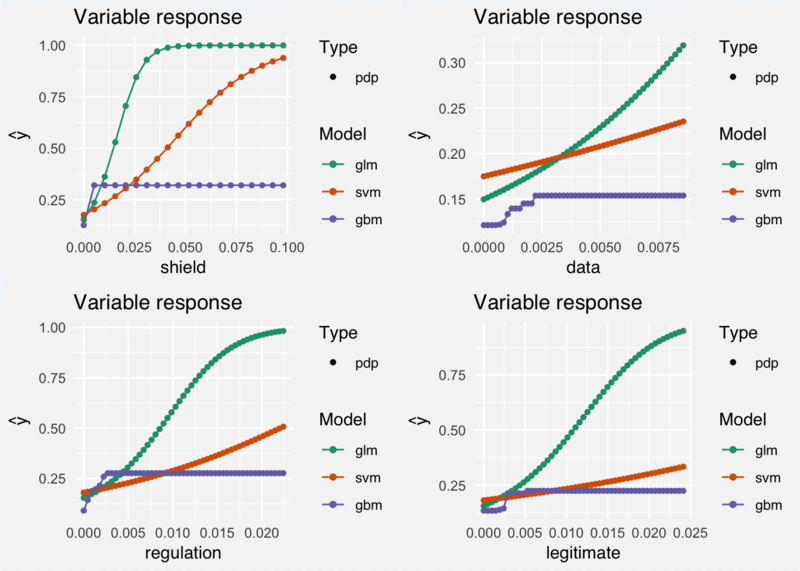 It only took fitting some models and creating a few plots and I already feel a lot safer under GDPR. After all, this policy is aimed at protecting your data against the sort of abuse we have been hearing about in the news of late. Not only that, but the coming of GDPR and the need for explainable machine learning has also been a boon for a fast growing collection of model interpretability tools such as lime, ShapleyR, live, xgboostExplainer, breakDown. While text classification is perhaps an atypical usecase for DALEX, it works just as well and is suprisingly fast even with our large document-term matrix. However, I am curious to see how an actual case of someone asking for model clarification would look like under GDPR and what explanations would suffice to satisfy. Either way, the R community seems to be prepared for now.